Tuscan Traveler’s Tales – Have You Seen Arnie & Soot? Within the historic center of Florence, the Arno River, the islands supporting its bridges and the intermittent riverbanks abound with wildlife. The observant and patient visitor can see carp, catfish and mullet under the Ponte Vecchio and from the balconies of the Lungarno Hotel. Midway on the Carraia Bridge and on the Rowing Club lawn, a family of nutria (kind of a cross between a mouse and a beaver) searches for scraps. Rats and mice pop up everywhere. Herons, ducks, gulls egrets and pigeons are not hard to find. But there aren’t many cats. Feral cats hang out in the Boboli Garden (they’ve got their own 2011 calendar), along the steps down from Piazzale Michelangelo (look for the ‘kitty kabanas’), and are starting to take up residence in the Bardini Gardens. So it was intriguing to see an article entitled Fan Mail in the January 11, 2007 issue of The Florentine, Florence’s English language newspaper. 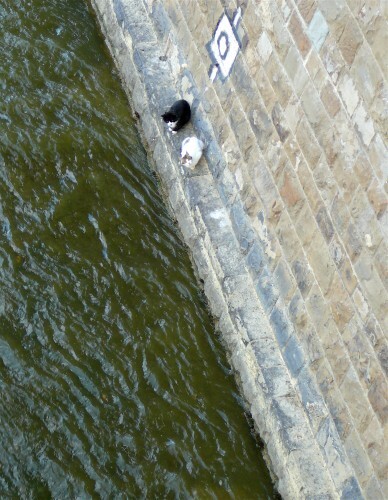 Kate McBride, an expat photographer and poet, wrote this ode to a cat named Arnie, who apparently was living in a hole at the bottom of a pillar of the Ponte alle Grazie (the bridge upstream from the Ponte Vecchio, which once supported tiny houses where the nuns of the Grazie lived). 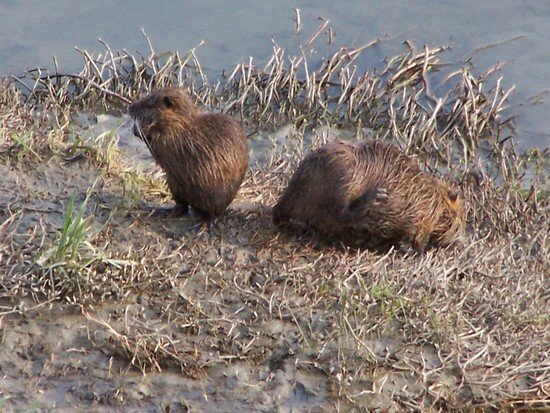 Note to Kate: there are no muskrats in the Arno – those are nutria. I went to look for the cat. And couldn’t find it. Granted Ms. McBride’s description of the exact location of Arnie’s home wasn’t precise and it is a big bridge. Each time I crossed that way I looked for the cat and in 2009 I found Arnie. Or maybe it wasn’t Arnie. 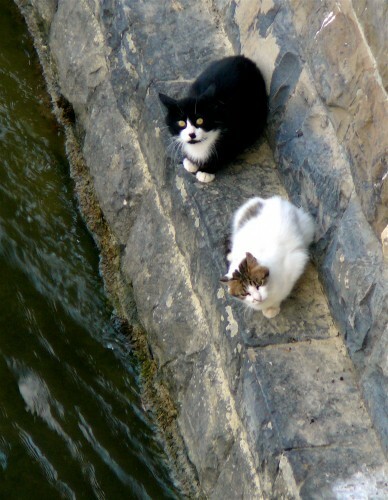 The cat I saw was a large black and white cat sitting on a very narrow ledge inches above the waterline. I didn’t see the hole-home. 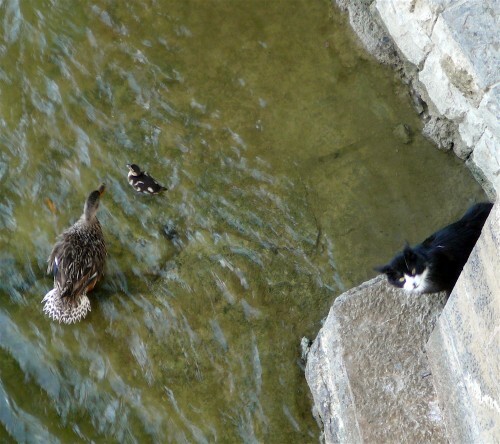 But, like Ms. McBride, I couldn’t tell how the cat got to that spot or could leave it – the ledge cut off about four yards downstream and crumbled away to just an inch upstream. The reason I now think that my 2009 sighting wasn’t Arnie is because this year there were two cats in the same spot – the same one from the year before and another of the same size, but with light brown and white fur. 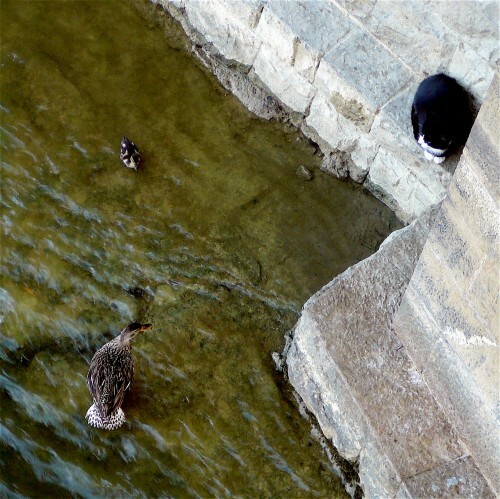 They were eyeing a mother duck and her sole duckling. 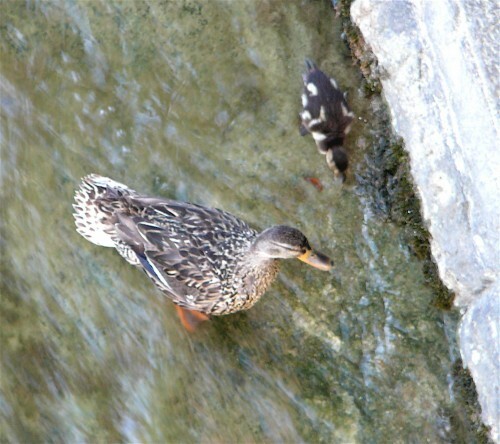 (I only hoped that this was a modern mother duck, who stopped at one offspring, as is the Italian habit these days, rather than the possible alternative.) I now have reason to believe that I was seeing Arnie and his friend Soot. 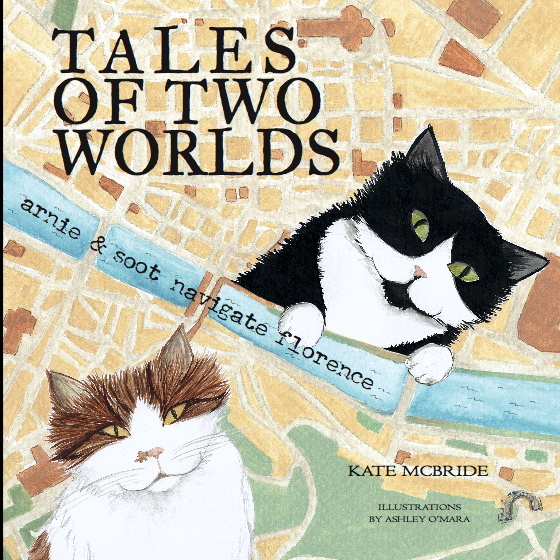 This month, Kate McBride introduces her enchanting book about Arnie and Soot (Soot of the black and white patches) – Tales of Two Worlds: Arnie & Soot Navigate Florence. Told from the cats’ point of view the story follows first Arnie down from the hills near San Miniato to his new home in the Ponte alle Grazie. He encounters Soot along the way as well as other friends, both feline and human. Ms. McBride uses these unusual protagonists to introduce young and old, alike, to her favorite parts of Florence – churches, theaters, shops, restaurants, etc. 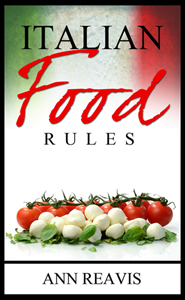 Favorite Tuscan foods figure big in the story (this is Italy after all) and recipes are included. Canadian Ashley O’Mara illustrates the narrative. James O’Mara’s photography and Ms. McBride’s Polaroid shots provide the local Florentine atmosphere. The last time I saw Arnie and Soot it was evening and a man was standing at the railing of the bridge, tearing off pieces of raw meat out of a grocery store styrofoam and plastic-wrapped package, aiming each bit at an angle toward the thin ledge where the cats sat looking up. I wondered if he was the same man Kate McBride saw almost four years ago. Tales of Two Worlds may be purchased at the Paperback Exchange in Florence, from the publisher, Mandragora, and from Amazon U.K. or probably by contacting Kate McBride directly at info@arnieandsoot.com . Ho visto spesso i gattini sotto il ponte e sono bellissimi, mi è piaciuto l’articolo, molto interessante ed il libro deve essere anche carino. Grazie del suggerimento della “Specola” la mostra è interessante il Museo magnifico, io l’ho visitato più volte e sempre mi affascina.